Better late than never: Terminal Reality has finally patched Ghostbusters, meaning that you can now achieve a perfect Gamerscore. When Ghostbusters: The Video Game was released last year, there was a bug in the 360 version of the game that prevented players from earning four achievements. Developer Terminal Reality has just revealed that it's fixed the problem. 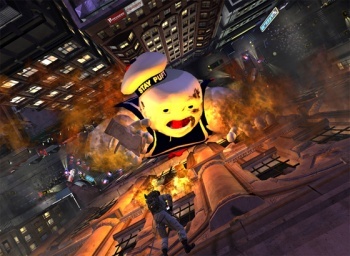 "The Ghostbusters Xbox 360 multiplayer patch is now available! Many thanks to all of our wonderful supporters for their patience and continued support! The next step is to go get those achievements, and they are some doozies! Thanks to our awesome QA staff, we have a step-by-step walkthrough of how to go about getting them." Exactly what took the developer so long to fix the problem hasn't been revealed, but at least they finally were able to resolve the issue. At the moment, Terminal Reality is working on the Star Wars Kinect game. I was just as amazed. However the good people on the X360A forums say that it suffers from the PS3 patches same flaws, if you have reached the achievement criteria pre-patch then it still won't unlock post-patch. Took them so long to fix probably because the ghostbuster haven't been relevant since 1988. And the "extreme" ghostbusters didn't help anything either. Thank you! Finally I can play my game in peace! ..........Wait....where is it......oh yeah, I traded it in -_-....darn it. They certainly took thier time, not that anyone was waiting or anything. Oh, snap! Take THAT, Ghostbusters! They should have patched the NES ghostbusters while they were at it. I mean the same amount of people play the game now. I wonder if anyone still plays the MP. Basically people paid €60 for a broken MP game. Nice. Also very sloppy. And yet the PC version is still apparently impossible to finish. Is it? I have finished it 3 times... Hmmm I am able to achieve the impossible... Must be my superpower. Is loads an actual number or something you are trying to shovel? Shovel? What does that mean? Really? They waited this long and expect people to jump back into the game? Seriously, they shouldn't have added some extra multilayer content thats unlock-able by getting the remaining achievements. At least that way they could've increased sales for the game this holiday. unless you were on the PC, then you didn't even get that. Never had a chance to play the online. But I'm surprised that it took this long for a patch to come out. I am pissed because I unlocked them, now however they are locked... I dont know what I did, but I just cant be fucked to earn them again. I really liked this game. It cost me Â£12 and I traded it in for about Â£8 so all in all it was a good experience for me. Especially since I don't have gold so it didn't bother me about MP cheevos.